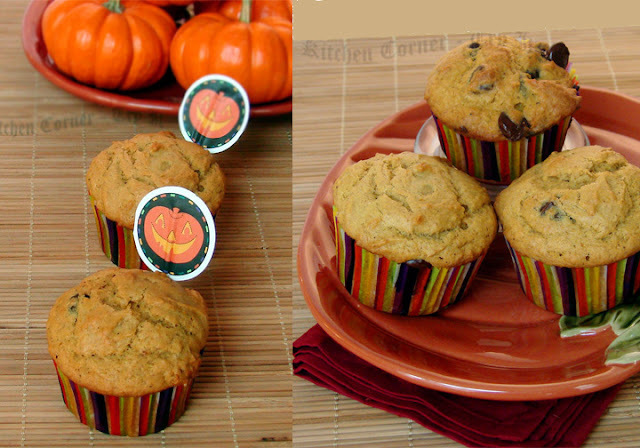 So keeping with the festive theme, Swathi, suggested baking a muffin/cupcake featuring pumpkin. Three delicious recipes were suggested by the baking partners and we can select one or bake all three. I made Pumpkin Chocolate Chip Muffin suggested by Reshmi of Easy Cook..This recipe is from one of my favorite sites Joy of Baking. Thanks Reshmi for suggesting this wonderful recipe. 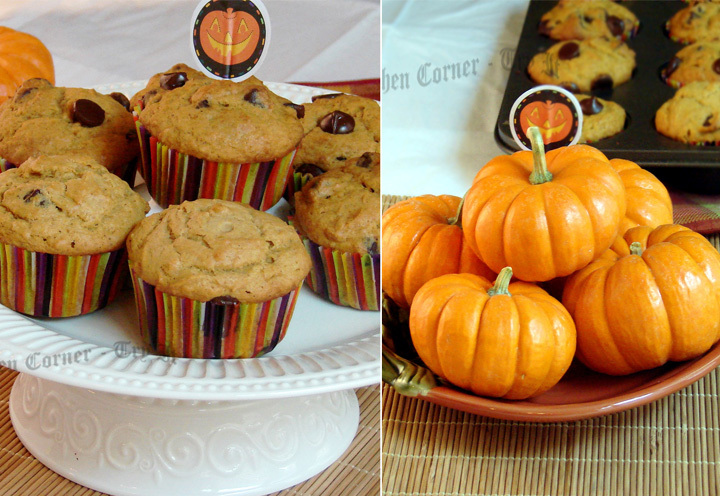 This months theme was challenging for me as I have never tried baking with pumpkin puree. I made this with home made pumpkin puree.The muffin was delicious,moist and full of flavor and chocolate chips is a sweet surprise and makes it even more exciting for kids. Unlike regular muffins it is little more rich with the addition of butter and chocolate chips. Baking partners is a lovely group created by Swathi of Zesty South Indian Kitchen and I am happy to be part of the group. Thanks Swathi for this wonderful theme. Try this recipe,you will surely love it. I use a 2 1/2 pound of sugar pumpkin( the smaller round variety) and I got approximately 2 cup puree (you can freeze the rest) Rinse the pumpkin and cut off the top and cut open into half,scoop out the seeds and fiber. Rub vegetable oil in the inside and place the cut side down in a baking pan lined with parchment paper. Bake for about an hour at 350 degree F. You can check it by piercing a knife and if the flesh is tender the knife will go in and come out smoothly. Allow to cool and you can peel out the skin or simply scoop out the flesh and put into a food processor and blend.Refrigerate till it is ready to be used. Preheat oven to 350 degrees F (177 degrees C). Place rack in the middle of the oven. Line 12 muffin cups with paper liners. Bring eggs and butter and pumpkin puree to room temperature. In a large bowl, sift together the flour, baking soda, ground spices, and salt. In a separate bowl cream the butter and sugar until light and fluffy using a hand mixer.Add the eggs and beat well till it is light and fluffy.Mix in the vanilla extract. Fold in the dry ingredients and pumpkin puree alternately in three additions, beginning and ending with the flour mixture. Fold in the chocolate chips. bake for about 18 - 20 minutes, or until a toothpick inserted in the center of the muffins comes out clean. Place on a wire rack to cool. Yummy muffinş. Loved the Addition of chocolate chips. Wonderfully presented Suja. Lovely and yummy muffins. Adipoli, You did very well Suja Yummy. Ennikku ishtapettu. Those Chocolate chips sticking out look so tempting!! Wonderful flavor in muffins..Loved your presentation Suja..
Pumpkin muffin looks soft and delicious. yummy recipe. Join me in Fast Food event-Vermicilli in my blog. Loved being your bakng partner the muffins look so good and yummy. Those look like perfectly baked muffins and I sooo love the presentation! You made your own pumpkin puree? I'm impressed. I have done some pure and waiting to make something special out of it.. this looks too good Suja..
Nice combination muffins, luv it!! Your muffins are beautiful and look so irresistible! I love all your pictures too!